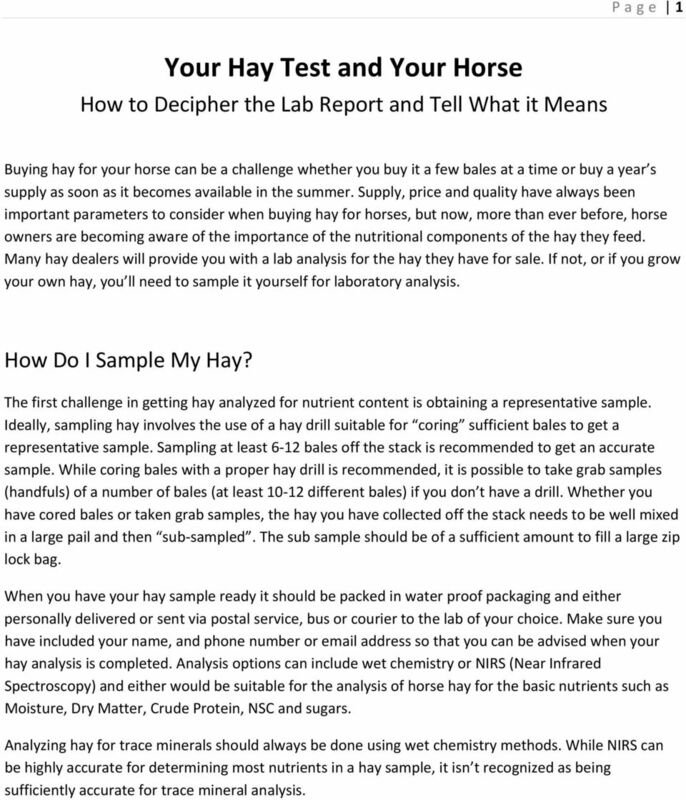 Download "Your Hay Test and Your Horse"
1 Page 1 Your Hay Test and Your Horse How to Decipher the Lab Report and Tell What it Means Buying hay for your horse can be a challenge whether you buy it a few bales at a time or buy a year s supply as soon as it becomes available in the summer. 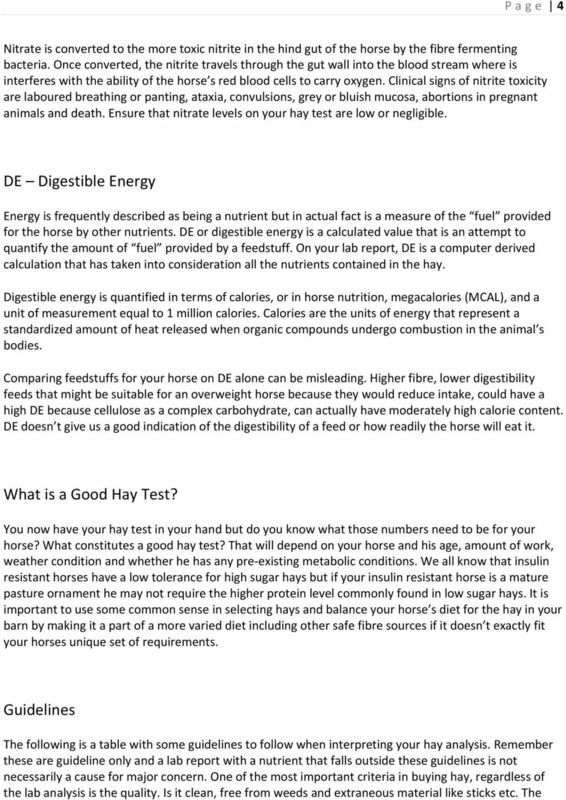 Supply, price and quality have always been important parameters to consider when buying hay for horses, but now, more than ever before, horse owners are becoming aware of the importance of the nutritional components of the hay they feed. Many hay dealers will provide you with a lab analysis for the hay they have for sale. If not, or if you grow your own hay, you ll need to sample it yourself for laboratory analysis. How Do I Sample My Hay? The first challenge in getting hay analyzed for nutrient content is obtaining a representative sample. Ideally, sampling hay involves the use of a hay drill suitable for coring sufficient bales to get a representative sample. Sampling at least 6 12 bales off the stack is recommended to get an accurate sample. While coring bales with a proper hay drill is recommended, it is possible to take grab samples (handfuls) of a number of bales (at least different bales) if you don t have a drill. Whether you have cored bales or taken grab samples, the hay you have collected off the stack needs to be well mixed in a large pail and then sub sampled. The sub sample should be of a sufficient amount to fill a large zip lock bag. When you have your hay sample ready it should be packed in water proof packaging and either personally delivered or sent via postal service, bus or courier to the lab of your choice. Make sure you have included your name, and phone number or address so that you can be advised when your hay analysis is completed. Analysis options can include wet chemistry or NIRS (Near Infrared Spectroscopy) and either would be suitable for the analysis of horse hay for the basic nutrients such as Moisture, Dry Matter, Crude Protein, NSC and sugars. Analyzing hay for trace minerals should always be done using wet chemistry methods. While NIRS can be highly accurate for determining most nutrients in a hay sample, it isn t recognized as being sufficiently accurate for trace mineral analysis. 2 Page 2 How do I Read the Lab Report? As Fed versus Dry Matter Basis Your first look at your hay analysis report may be intimidating. You will see a large collection of numbers, usually arrayed in two columns labelled as As Fed and Dry Matter Basis. 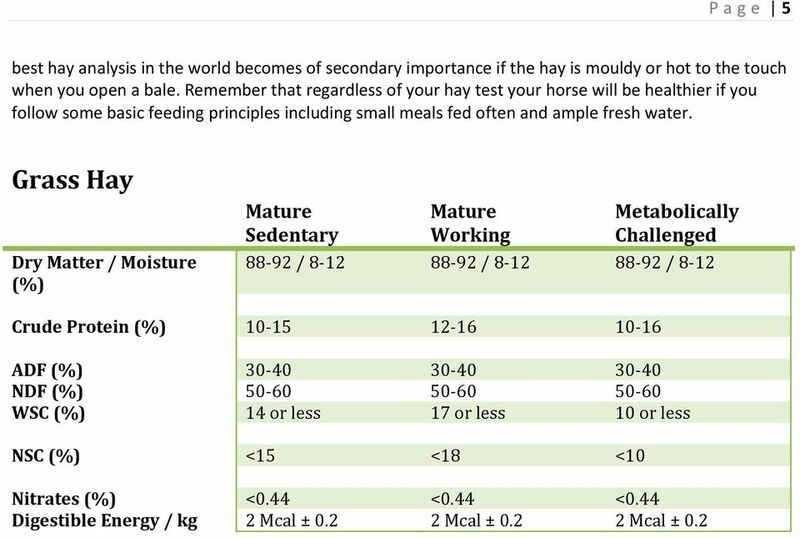 For the purposes of evaluating the hay for your horse you will most often consult the Dry Matter Basis column. Both sets of numbers represent the actual amount of the specific nutrient in the hay but the As Fed column is reported with the values expressed as a percentage of the feed including the weight of the moisture in it. The Dry Matter Basis column is reporting the nutrients expressed as a percentage of the feed without the moisture included. Every feedstuff has moisture some have more than others. In order to accurately compare the inputs into your horse s diet of one feedstuff relative to another it is important to compare them on a dry matter basis so that the nutrients they contribute are not being diluted in percentage by the moisture present in the feed. Grass or alfalfa hay should ideally be 90% dry matter or over, indicating the presence of 10% moisture or less. More than 10% moisture in a hay sample could indicate a higher risk for mould or heating in the bales. Crude Protein Crude protein is an estimation of the total protein content of a feed. It is determined by analyzing the nitrogen content of the feed and multiplying the result by Protein in some feedstuffs such as grass silage or haylage can be further differentiated by criteria such as protein digestibility and protein quality. Generally grass or alfalfa hays that are 90% dry matter or above and harvested at a pre bloom or preboot stage contain a high quality protein of superior digestibility. The requirement for protein in the hay by a horse will vary according to what other feeds are being offered, the work level of the horses and the metabolic state ie growing mature, breeding stallion, lactating mare etc. 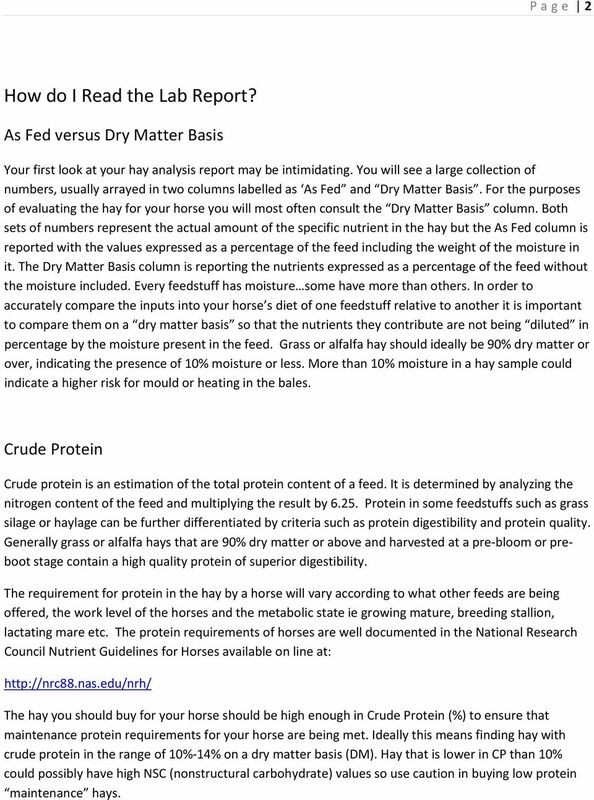 The protein requirements of horses are well documented in the National Research Council Nutrient Guidelines for Horses available on line at: The hay you should buy for your horse should be high enough in Crude Protein (%) to ensure that maintenance protein requirements for your horse are being met. Ideally this means finding hay with crude protein in the range of 10% 14% on a dry matter basis (DM). Hay that is lower in CP than 10% could possibly have high NSC (nonstructural carbohydrate) values so use caution in buying low protein maintenance hays. 3 Page 3 ADF and NDF and Lignin The terms ADF and NDF stand for Acid Detergent Fibre and Neutral Detergent Fibre respectively. These terms refers to the cell wall portions of the forage that are made up of hemicellulose, cellulose and lignin. These values are important because they give an indication to the ability of the horse to digest your hay to its component nutrients. As forage matures the ADF, NDF and Lignin values tend to increase. As ADF, NDF and Lignin increase, digestibility of hay usually decreases. The energy measurements such as DE (Digestible Energy) reported on your hay analysis are calculated using the ADF, NDF and Lignin values. ESC, WSC, Starch and NSC The terms ADF, NDF and lignin are all used to help quantify the cell walls in your hay test. 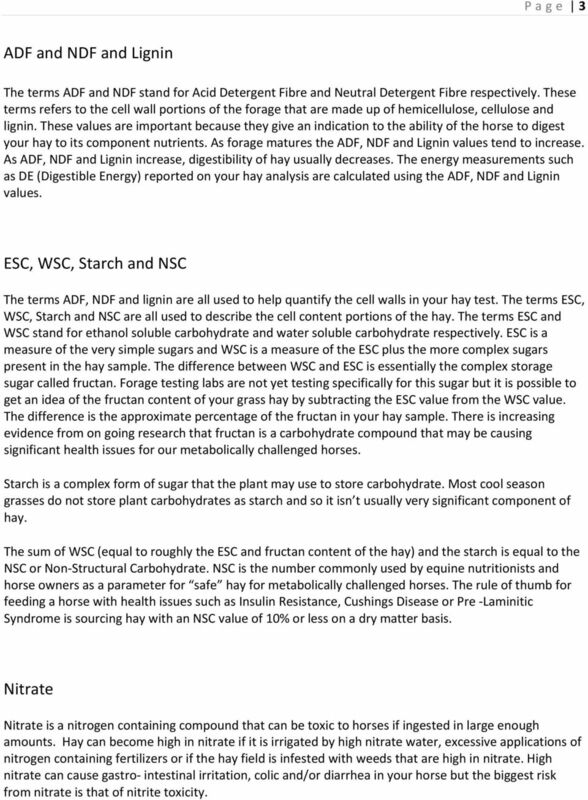 The terms ESC, WSC, Starch and NSC are all used to describe the cell content portions of the hay. The terms ESC and WSC stand for ethanol soluble carbohydrate and water soluble carbohydrate respectively. ESC is a measure of the very simple sugars and WSC is a measure of the ESC plus the more complex sugars present in the hay sample. The difference between WSC and ESC is essentially the complex storage sugar called fructan. Forage testing labs are not yet testing specifically for this sugar but it is possible to get an idea of the fructan content of your grass hay by subtracting the ESC value from the WSC value. The difference is the approximate percentage of the fructan in your hay sample. There is increasing evidence from on going research that fructan is a carbohydrate compound that may be causing significant health issues for our metabolically challenged horses. Starch is a complex form of sugar that the plant may use to store carbohydrate. Most cool season grasses do not store plant carbohydrates as starch and so it isn t usually very significant component of hay. The sum of WSC (equal to roughly the ESC and fructan content of the hay) and the starch is equal to the NSC or Non Structural Carbohydrate. NSC is the number commonly used by equine nutritionists and horse owners as a parameter for safe hay for metabolically challenged horses. The rule of thumb for feeding a horse with health issues such as Insulin Resistance, Cushings Disease or Pre Laminitic Syndrome is sourcing hay with an NSC value of 10% or less on a dry matter basis. Nitrate Nitrate is a nitrogen containing compound that can be toxic to horses if ingested in large enough amounts. Hay can become high in nitrate if it is irrigated by high nitrate water, excessive applications of nitrogen containing fertilizers or if the hay field is infested with weeds that are high in nitrate. High nitrate can cause gastro intestinal irritation, colic and/or diarrhea in your horse but the biggest risk from nitrate is that of nitrite toxicity. Mythbusting: Forage and the Equine Diet ASPCA. All Rights Reserved. How Do I Select Quality Hay? A Review of Factors Affecting Carbohydrate Levels in Forage. Kathryn A. Watts, B.S., N. Jerry Chatterton, Ph. D.
Fiber in Beef Cattle Diets While energy and protein are often the major focus of many beef cattle nutritional programs, fiber is another essential diet component beef cattle producers need to consider. Cattle and Horse Nutrition. Johnson County University of Missouri Extension Livestock Specialist Patrick Davis, Ph. D.
FORAGES Gwinyai E. Chibisa, Ph.D.
FORAGES Gwinyai E. Chibisa, Ph.D. http://craig-stephen.photoshelter.com/image/i0000ywgwhaenwsi What is Forage? Characteristics i. Bulky ii. iii. Implications on animal nutrition? High fiber Is fiber important? High-Fiber Low-Starch Diets: The New Nutritional Wisdom Kathleen Crandell, Ph.D. FIBER DIGESTIBILITY AND STARCH CONTENT OF CORN SILAGE. Neal P. Martin, David R. Mertens, Mary Beth Hall, and Joe G.
FIBER DIGESTIBILITY AND STARCH CONTENT OF CORN SILAGE Neal P. Martin, David R. Mertens, Mary Beth Hall, and Joe G. Lauer 1 ABSTRACT Corn silage is a major forage crop in Idaho, supporting its dairy industry. Keywords Ruminant; dry matter; daily dry matter intake; fresh weight; forage; reference table. GROWERS GUIDE TO LUCERNE All Rights Reserved. No part of this publication may be reproduced or used in any form, or by any means (including photocopying) without the prior permission of the Publisher. Page 1 of 22 Forage Nutrition for Ruminants AS-1250, June 2004 J.W. Schroeder, Extension Dairy Specialist Plants utilized in the feeding of livestock have long been a fundamental link in the food chain. Starch is made up of long chains of glucose molecules joined together. It is found in foods like bread, rice, potatoes and pasta. Making the Most of Milk Understanding Lactose Intolerance Objective Students will learn what causes lactose intolerance and carry out a laboratory activity to test a treatment for lactose intolerance. Equine Cushing s Disease & Metabolic Syndrome. So what is Equine Cushing s disease? What does Equine Cushing s look like? Sheep Nutrition. Sheep Nutrition. Nutrient Needs. Sheep Nutrition Water. Products Produced. Use of Pasture\Range and Forages.